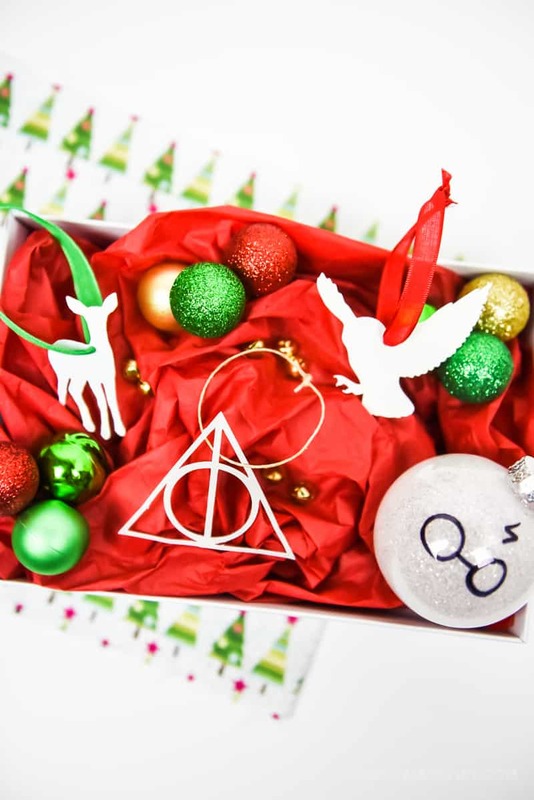 Decorate your tree with these easy-to-make paper Harry Potter ornaments this year! When I first met Chris he had never seen a Harry Potter movie or read any of the books. He still hasn’t read the books but he has binge watched all the movies (more times than I’d like to count) with me! I may still be the reigning Harry Potter addict in our family, but he’s on his way and that makes me pretty happy. That’s why he didn’t even bat an eye when I said I wanted to do a Harry Potter themed Christmas tree this year. He was all for my idea and has let me run with it. I started out with some Fantastic Beasts & Where to Find Them ornaments and then decided to make some Paper Harry Potter ornaments to go with them! To be honest, ever since I saw Fantastic Beasts & Where to Find Them I have wanted a Niffler. I actually wanted one way back when Hagrid brought them to Care of Magical Creatures class, but I digress….Have you seen them? They’re so cute! I cannot get them out of my mind and as I was deciding what Harry Potter ornaments to make I realized that magical creatures would be so cute on the tree! I’m a little sad that I couldn’t find a Niffler, but I think I came up with some other fun ideas to share! Harry Potter and Fantastic Beasts have some pretty awesome creatures in the movies, but I decided to stick with the ones that are well known and recognized within the fandom. And I may have thrown in a non-magical creature just for good measure. 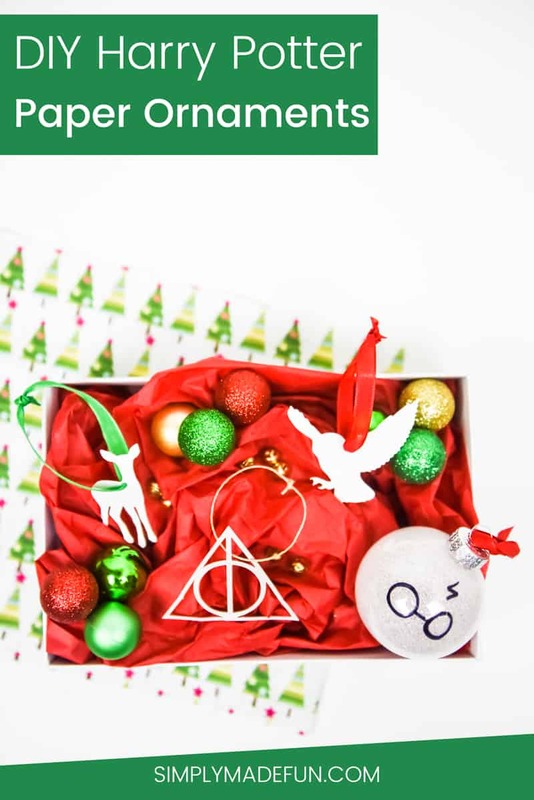 Let’s Make Our Own Paper Harry Potter Ornaments! 1. I got all my designs from google and traced them in the Silhouette Software. Then I sized them so they were around 2.5 inches tall. 2. Cut out your designs and then punch a small hole in them (I did not punch a whole in the Hallows symbol!). 3. Thread a piece of ribbon or twine through the hole and tie it at the top. 4. My paper had a shimmer to it already, but if you want to add more glitter you could always paint a layer of mod podge over your design and then pour glitter on top of it! Just remember to shake off and save the excess glitter to use for future projects! These Paper Harry Potter ornaments were so easy to make and they’re such a fun addition to the tree! You could use any creature or symbol you want, the options are endless. Plus it’s a nice break from all the bulbs. I really love mixing up the decorations because I think it makes the tree more visually appealing! And Chris is happy because this project cost me absolutely nothing since I had all the supplies at home already. Have you ever made your own paper ornaments for your tree? What would you add if you had your own Harry Potter themed Christmas tree? 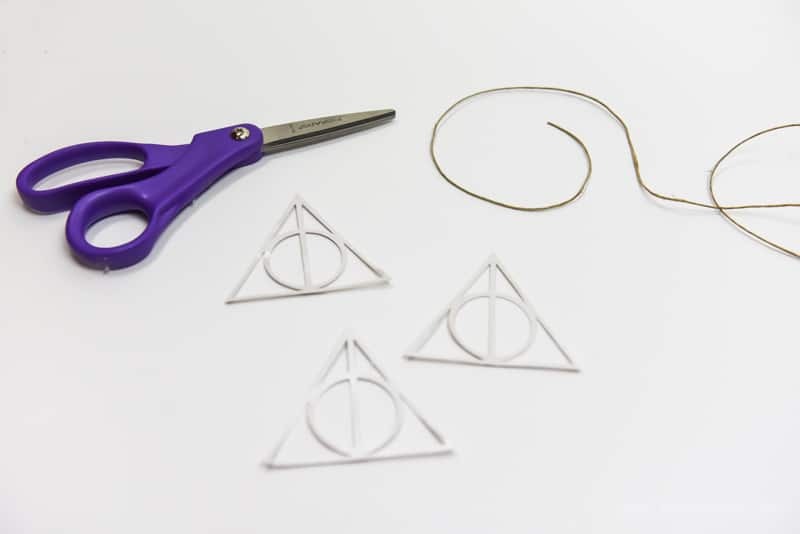 Want more Harry Potter crafts? Check these out!